Regardless of where you are in the world, pickpocketing is a real concern you should be wary of. While the crime is often synonymous with the cobblestone streets of old London, pickpocketing is still practiced today, with new techniques being developed and used against unsuspecting tourists and citizens. Pickpockets take the time to develop their skills, as the act involves stealing without the victim even noticing. Experienced thieves can swipe valuable goods from purses and pockets so swiftly that most victims don’t even realize they’ve been robbed until the thief is long gone. They may do this by using distraction tactics or by taking advantage of a crowd, disappearing once the deed has been done. In the past, men learned how to detract thieves by placing valuables inside their clothing. However, times have changed drastically, making the task a bit more difficult. With most men carrying much more than cash while they stroll around town, it’s more important than ever to be prepared and take the proper precautions. One of the easiest ways to avoid being pickpocketed is by wearing the right clothes and accessories. Here are 5 pieces of pickpocket-proof clothes to keep you safe and stylish. If your cash is the biggest concern, this belt from Eagle Creek will ensure that it stays as close to your body as possible. To would-be thieves, this piece looks like an ordinary nylon belt. However, it features an 18-inch zipper and a hidden compartment to stash your cash. It can hold folded up bills safely and discreetly. With the zipper against your body, it can’t be seen. It comes in black or brown and is easily adjustable. For even more convenience, the buckle has a quick-release mechanism and is made from plastic to make the trip through airport security a breeze. 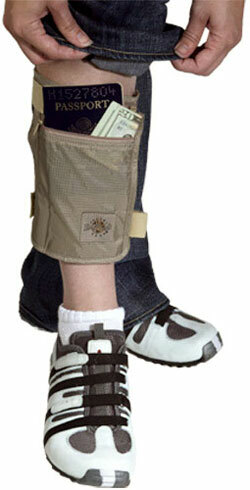 Another great option from Eagle Creek is the undercover leg wallet. Designed to be worn on the leg underneath the pants, it keeps a variety of valuables safe. The wallet is 8 inches high and features two zippered pockets. To stay snug, the wallet has nylon straps that can be fully adjusted with the hook and loop closure system. The back of the wallet has a breathable mesh that wicks up moisture to keep your leg dry throughout the day. Overall, the wallet is large enough to hold your passport, identification, and cash, yet small enough to stay discreet underneath your pants. These two pieces are great for cutting down the bulk, allowing you to keep important items close to you in your front pocket. The stainless steel money clip holds up to 30 bills snugly while also securing 10 cards. Instead of carrying a wallet, the clip condenses what you need so that you can keep it close at hand. The Smart Pocket Wallet will hold any other belongings you need on your adventure. It can hold anything from loose change to keys. The velcro closure keeps the flap closed while the robust clip makes it easy to secure the entire wallet onto the waist of your pants and away from the hands of thieves. One place that a thieve couldn’t access without your knowledge is your feet. These socks from Travelon are great for keeping cash and valuables safe while you’re on the go. Each sock has a small pocket to keep cash, keys, and other small valuables secure. The zipper is tough and even blends in with the cotton blend fabric. While it is a smaller pocket compared to other alternatives, it’s a great option for keeping emergency cash on hand at all times. Is there any place safer than your underwear? With a pair stash underwear from Speakeasy, you can rest assured that your belongings are safe and sound. These boxer briefs have a zippered pocket on the front that is sizable enough to stash a passport and cash without being uncomfortable. Made from a comfortable blend of modal, cotton, and spandex, the boxer briefs feel great and are easy to wear. They feel like a normal pair of underwear, allowing you to get dressed, stash your valuables, and go on with your day with peace of mind. While thieving pickpockets may use cunning tactics to steal, you can take the proper precautions to outwit them. Just a bit of basic knowledge will give you the upper hand. You can know what to look for and how to secure your belongings to stay safe. It’s important to stay aware of your surroundings at all times. This is especially true in urban areas and busy city streets. 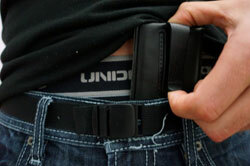 Pickpockets like to work in densely populated areas, as it is easier to blend in with the crowd and get away. By staying present in the moment, you’ll be able to see potential warning signs, such as strangers touching you or possibly watching you as you approach. There are a few different areas pickpockets frequent. One of the biggest is tourist attractions. Tourists are an easy target for thieves, as they don’t know the area very well and are often distracted by the sights. If you’re in a tourist area, stay alert while you enjoy. Other areas include public transportation and restaurants. Contrary to popular belief, pickpockets often blend in very well with the crowd. Depending on where you are, this means that thieves can be dressed very well, making them hard to spot. Furthermore, thieves often work in groups, using disguises and diversions to get the job done. Pickpockets can be any age, including small children. To prevent falling into a trap, it’s a good idea to be cautious with anyone that approaches you in the street. Loose clothing can make you a huge target. If you are wearing a large jacket or shirt, thieves can get into your pockets much easier without you feeling it. Tighter clothes will ensure that your belongings stay close to you, making it difficult for thieves. Clothing items like the ones listed above will also hide your valuables from pickpockets searching for their next target. Another good idea is to blend in with the crowd. If you are visiting a popular tourist destination, you should try to dress like a local. Standing out as a tourist can prove to be detrimental, making you a quick target for thieves. By keeping the valuables you are carrying to the bare minimum, you automatically reduce the chances of thieves stealing from you. Minimalist wallets are a great alternative to standard wallets for this reason. 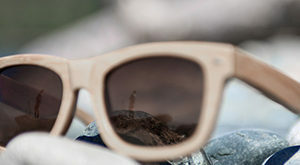 The small and streamlined size provides only enough room for a credit card, identification, and possibly a bit of cash. These wallets can also be kept in the front pocket rather than the back pocket. This ensures that thieves won’t be able to steal from you without you noticing. With the right clothing pieces and a bit of knowledge, you can avoid becoming another pickpocketing victim. While the crime has steadily declined over the years, it is still a major issue all over the world. Whether you’re a guy trotting the globe or simply someone who’s exploring a new city, it’s important to be prepared for the unexpected. 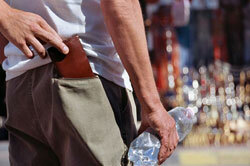 The right precautions will ensure that pickpockets leave empty handed.